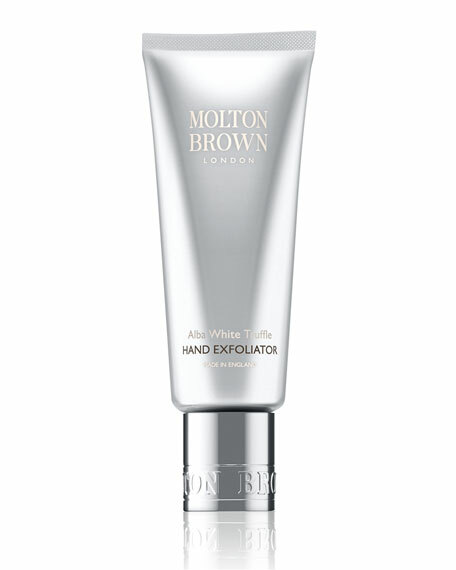 A kind-to-skin, creamy exfoliating scrub that gently lifts dead skin cells to reveal silky-smooth hands. Enriched with a deeply soothing scent, soften and nourish your skin. Rare Alba truffle extract to sumptuously soften skin. Cocooning aromas of nutmeg, olibanum and vanilla. Usage: Gently massage into damp skin using circular upward motions and rinse hands thoroughly with warm water. Afterwards, moisturize with Alba White Truffle Hand Treatment for extremely effective care.